When you’re putting a message together you need to be aware of what kind of form people like to hear a message take. Some people like stories, or quotes, or to see the data behind something, or even to be coached through an exercise that helps them experience a message for themselves. Where someone falls on that spectrum comes down to two variables: the level of emotion infused in a message, Head versus Heart; and the level of prescriptiveness in a message, Show versus Tell. If you think about this as a grid with emotion on the x-axis and prescriptiveness on the y-axis, you get four areas that represent the four message mindsets you need to think about when you’re shaping your message. In the top left is the Commander, high Head and high Tell: someone who prefers to use sharp quotes, strong statements, and declare things as they see them. If that’s your favorite kind of talk, then you probably have that same mindset as a listener. If you look at the other corner, high in Heart and high in Show, you find the Commander’s opposite: the Counselor. People with this mindset like to show or be shown what a message looks like, but in an empathetic way that helps them understand it for themselves. Counselors tend to use thought exercises, metaphors, and examples to help their audience see what this might look like for them. 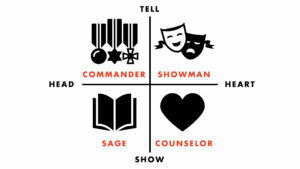 In the upper right, high in Tell (like the Commander) but also high in Heart (like the Counselor), is the Showman. People with this mindset love hearing and telling stories. A Showman loves to engage people’s emotions, but do it in a very prescriptive way. The opposite of the Showman is all Head and Show: the Sage. These people like to present external data, but they also want to show you what all the options are. The real problem we have to solve as message makers is that we tend to default to the mindset that we prefer the most. A story will connect with the Showmen in your audience, but the Sage is sitting there thinking, “Where is the data to support this?” The thing to realize is that we all have all four message mindsets within us, and the best message makers rotate between those message mindsets depending on what the audience and the message requires. When you’re putting together your message, make sure that you find a way to appeal to all four message mindsets, especially when it comes to the key points in your Red Thread: the Problem, the Idea, and the Change. And finally, remember that you’ll be best when you balance the mindset you most prefer with its opposite: the Commander balances the Counselor and the Showman balances the Sage. There are four message mindsets that we use and fall into whenever we think about or present our messages. Which one are you? I’m Tamsen Webster of tamsenwebster.com, and that’s what we’re talking about this week on Find the Red Thread. When you’re putting a message together, you are putting it together with an audience in mind, at least I hope you are. And with that audience in mind, we want as many people in that audience to hear our message and respond to it, whether that’s to think differently or to act differently. Now, we know there are a whole bunch of things that can get in our way but the thing I wanna talk about today is the kind of evidence, the kind of illustration, the kind of feeling that people prefer to hear that message in. What does that mean? Well, do they like stories, or do they like quotes, or do they like to see the data behind something, or do they wanna be coached through an exercise that helps them experience that message in play for themselves? Each of those things comes down to two different variables that I’ve seen over the work in my career. And those variables are the difference between the level of emotion that leads that message and the level of, let’s call it prescriptiveness. How much do they like to be shown versus told? You can think of this as a two by two matrix where the x-axis has that emotional piece. Think of the left as having Head, and the right having Heart, and the y-axis, which is the one that shows how much people like to be told or not. So at the top of that one is Tell, and the bottom is Show. So we have Head/Heart and Tell/Show. What that does is create four distinct message mindsets. The high-Tell, high-Head is something I call the Commander. So if you are someone who prefers to use sharp quotes or strong statements and likes to declare things as you see them, “We have nothing to fear but fear itself,” then you are likely a Commander. If that’s your favorite kind of talk, then you probably have that message mindset as a listener, too. Now, what happens if we go to the opposite corner? Well, the opposite corner would be high in the Show category and high in the Heart. That creates the Commander’s opposite, what I call the Counselor. The Counselor message mindset is one where people really like to be shown what the message looks like, or if you’re the person giving it, where you like to show rather than tell people, here’s what to do. But you’re doing it from a point of empathy, of helping people understand for themselves. If you fall into this category, then you tend to like to use a lot of thought exercises, a lot of metaphors, a lot of examples for people so they can see what this might look like for them. So what about the other two styles? Well, the other two styles are made of the opposite of those. So if we’re talking about high Tell like the Commander but high Heart like the Counselor, then you have a Showman. Showmen love stories, whether to hear them or to tell them. They love to engage people’s emotion, not just happiness and sadness but fear and anger and motivation, inspiration. They really appeal to feeling, but they do it in a very telling way. The opposite of the Showman is the Sage. Now, this person is the opposite of all of those things. So this person has high Head. They like to present external data, but they like to use other sources. They’re going to show you what the options are. I like to remember them this way. It all comes down to the phrase, “This is right.” So a Commander would like to say, “This is right.” They like to tell people, and they want to be told, that’s their preferred style. A Showman will say something along the lines of, “Let me tell you a story that shows you why this is right, and you’ll see for yourselves.” So, telling a story that tells you exactly what you’re supposed to think or feel, but it’s still going to come in this very emotion-based place. Now, what does the Counselor say? The Counselor has the equivalent of saying, “I know you’ll know when this is right.” So, they’re gonna have that person experience it for themselves, and even though they may have an opinion, they have a tendency to let the audience make their own choice. So if that sounds appealing to you, that might be your message mindset from an audience standpoint, too. And finally, the Sage? The Sage tends to say, “The data show this is right.” In other words, let research show. So I may have an opinion as well, but I’m going to deliver it from insightfulness, but I’m going to show you what other people say. That’s a Head-leading, Show-ing approach. So here’s the thing to understand, is that as message makers, in fact, as audience members, we all have all four message mindsets within us. The best message makers, the best communicators, the best leaders learn how to rotate between those message mindsets depending on what the audience and the message requires. Think about it this way: what do you think you want to open a message with, something that shows people what the Goal or the Problem looks like but still draws a point out of it? Well, that’s probably going to be starting with something the Showman would do. But you want to make sure you draw the point, so you’re going to move over to the Commander afterwards. Then to make sure that somebody understands what it says and what it means to them, you’re probably going to want to walk them through a thought exercise like a Counselor would. You may want to support all of that with data that pleases the Sage. Do you have to do that for every point? No, but I would recommend that for the key points in your message, whatever it may be, particularly for the Problem, the Idea, and the Change, that you consider using all four message mindsets. And one last tip: whatever you most prefer, let’s say you’re a Commander, you’re going to be best when you start to balance out with your opposite: Commander-Counselor, Showman-Sage. That’s this week’s episode of Find the Red Thread. I’m Tamsen Webster of TamsenWebster.com.